Wild goats are very agile and hardy, able to climb on bare rock and survive on sparse vegetation. The Nubian ibex (Capra ibex nubiana) is a rocky desert dwelling goat found in mountainous areas of Israel and throughout the Middle East that eats mainly grasses and leaves. 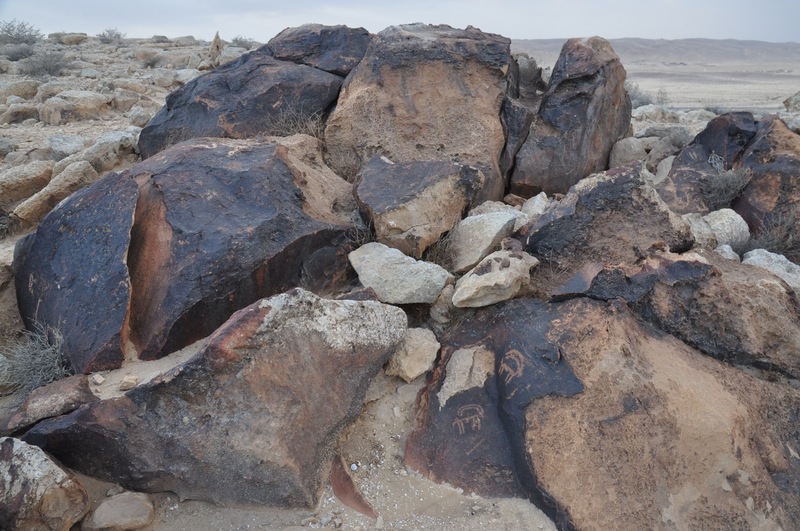 Archaeologists have found evidence of the ibex on cylinder seals and painted on pottery. You can find rock drawings of ibex on a hill above Carmei Avdat, a family farm where grape vines grow on original Nabatean terraces. Across from the farm is the En Avdat nature reserve. I was hiking with a client in the canyon mid-morning and the sun was perfectly backlighting a grove of Euphrates poplar trees for a great photo. Near the entrance is a large Pistachio Atlantic tree with gnarled branches and strong roots anchoring it in a field of rocks. This tree was ablaze in reds and yellows – one of the things I miss is the beautiful autumn colors I used to see in Canada. As I looked up among the branches I saw an ibex that had climbed 10 feet up into the tree. Unfortunately, I didn’t have my camera. There is a good chance to see ibex at nearby Sde Boker, overlooking Nahal Zin. Farther south, you can see ibex in the parks and on the edge of the makhtesh at Mitzpe Ramon. Ein Gedi is a great place for a hike, to take a family to experience springs, waterfalls and pools in the desert. 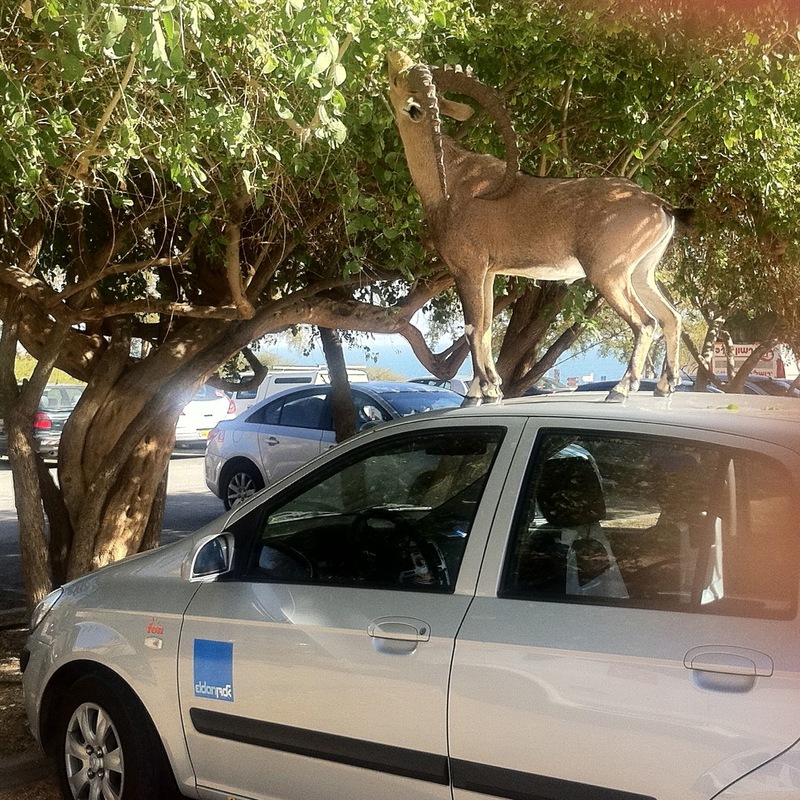 Today as we pulled into the parking lot, we saw a male ibex on the roof of a Eldan rental car so that it could reach the leaves of a nearby tree. I know ibex are good climbers and the ibex in the Ein Gedi reserve are used to people but that was certainly a surprise. This entry was posted in Nature and tagged car rental, desert hike, Ein Gedi, family hike, Hiking, ibex, pool, water hike, waterfall on December 28, 2010 by Shmuel Browns.